What is fantasy one day may be reality the next. The Human Genome Project and cloning are the twenty-first century's newest ventures into the relationship of technology and death. The mapping of genes looks for medical advances to prevent disease, cure patients, and extend human life. The goal of curing or preventing diseases linked to one's genes is a major incentive for researchers and investment capital to drive technological change for the greater good. Utilitarian arguments challenge traditional principles and values that seek to limit the number of deaths in the process of change. Success in developing cures for various diseases has universally given rise to the expectation that it is just a matter of time until medical scientists will discover cures for cancer, HIV/AIDS (human immunodeficiency virus/acquired immunodeficiency syndrome), and other diseases. Supporters of change argue that society would benefit from more tax incentives, research grants, research centers, and educated researchers to meet these important challenges. Technology is not a concept set apart from society, as dramatically seen in medical, ethical, and political debates over human experimentation with somatic and stem cell cloning. It is easy to recognize technology in society. It consists of devices, knowledge, and skills that can be used to control and utilize physical, social, and biological phenomena. A common intellectual error is to treat technology and society as distinct, independent entities. Technology, ideology, and social organization, while separate entities, are interrelated. This is particularly evident in the relationship of technology and death in modern and postmodern societies. The argument that technology drives social change is not a new one. Great thinkers such as Karl Marx, Henri Saint-Simon, and William Ogburn made the argument that improvements in technology lead to social change in society. Ogburn further suggested that there is a social lag between inventions and adoption of the change in society. For Western societies, technological innovation is a major source of social change that impacts dying and death. Consider the social and cultural impact that is involved in "brain death" laws that were enacted in most states by 1980. The impetus for redefining "death" to include "brain death" (the cessation of electrical activity in the brain and brain stem while circulation and breathing are sustained by machines) is due to medical research in human organ transplantation, particularly of kidneys, a major advance in medical technology. Early success in human organ transplantation began in North America in the 1960s with the "harvesting" of kidneys, and other organs, from cadavers. The donors were healthy persons who had died in an accident where medical (machine) support was available to sustain breathing and circulation. The need to change legal definitions of death to include brain death came to the fore when prosecutors began to charge harvesting surgeons with murder under existing laws. For the sake of the greater good, states began to adapt by passing legislation that allowed for collection of human organs when a person was "breathing" and had "a pulse." Still other social changes have taken place in the face of blood-borne pathogens and other contagious diseases. HIV/AIDS and other diseases have caused medical personnel and embalmers to adopt defensive measures including protective clothing, gloves, masks, and different chemicals to shield themselves from these diseases. The threat of terrorism in biochemical attacks challenges and changes both governments and everyday behavior in citizens regardless of the number and types of deaths that result. Most changes in technology are slow to be accepted, causing a social and cultural lag between the development of the innovation and its adoption. Examples include the reluctance of China to acknowledge the spread of HIV/AIDS and of Japan to enact brain death legislation in support of organ transplantation. While many technological developments languish for lack of support due to cultural belief, social values, or "the bottom line," others are seen as riding the tide of technological change. Medical information technology is accepted by some specialties as a way to be more efficient and accurate in treating patients and saving lives. High-tech medicine demands high-tech specialists to fight disease and challenge death. The institutions of hospice and palliative medicine provide a holistic approach to caring for the dying person and support family and friends who are part of the support team. It is not uncommon for hospice observers to ask if one has to die to get that kind of quality care. Yet hospice provides care for only a small percentage of all patients who die in the United States and only in the last stages of dying. Decisions by physicians, patients, and family members to reduce or stop aggressive medical treatments are not easy to make when high-tech medicine is standing by to try one more technique or treatment. Experimental protocols may be the only alternative treatment available, even though the study is being done to determine efficacy and side effects of the experimental drug. Increasingly, aftercare grief support programs are available for family, friends, and others. These are provided in hospitals, churches, and funeral homes. With the widespread use of the Internet, cyber mourning has led to the development of web sites for those who are grieving. These include sites for those suffering from grief for the loss of a spouse, child, parent, friends, siblings, and even pets. Having the technology available does not mean that people will choose to use it, but as use of the Internet increases the use of such sites will also increase. Technological change may be supported or resisted by work, family, and politics. For example, some people believe that were it not for political considerations, public health problems such as HIV/AIDS or drug addiction could be solved or better managed. Others view traditional religious organizations as impediments to lifesaving medical inventions, such as cloning for medical cures. Still other questions pose moral extremes: Should stem cell research be promoted or forbidden by legislation? Is abortion an evil to be avoided at all costs or a choice that respects the right of privacy? Is cloning research the hope of the future or an ethical error? Should experimental drugs be readily available to all patients even before their efficacy and side effects are demonstrated? Marked incongruence arises and persists between elements of technology and social organization. Advances in medical technology have led to public discussion and the legalization of assisted suicide only in Oregon and active voluntary euthanasia in the Netherlands. While the desire to live long has led to the adoption of medical technologies to greatly extend life, there has not been an accompanying adoption of means to medically manage individuals who choose not to live with the increased pain and suffering that sometimes come with extending one's life. Interestingly, physician-assisted suicide was less of an issue when the average life expectancy was under fifty years and medical science very limited compared to twenty-first-century methods. Until the ability to keep one's body alive long after the brain was functioning normally, little discussion of advance directives was put forth. Though the adoption of advance directives has been slow, its use is increasing in an era of high-tech medicine and frequent litigation that drives up the cost of American health care. 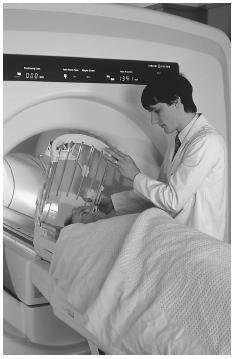 A radiographer prepares a patient for an MRI scan, a technology that revolutionized medical imaging by using magnets and magnetic fields. The results of a scan can save a patient's life by providing useful information in detecting serious health conditions . Azerbaijanis as well as Slavic nationalism in the former Yugoslavia. The twenty-first century has brought changes in Northern Ireland and South Africa and terrorist attacks have modified the world scene. The world, and the United States suddenly seems to be a much less safe place to live. The news of the world and its violence are available twenty-four hours a day. Events are televised as they occur. The world may not actually be more violent, but it appears to be if one follows the news media. Fear of mass death has lead to fear of flying, public events, energy plants, and even one's work environment. Biological terrorism, nuclear destruction, smart bombs, and car bombings are part of conventional conversations. Technology has brought death from the battlefield to where people live and work. Those who experience illnesses are generally thankful that their illnesses did not occur ten or twenty years ago. Improvements in medical technology are occurring at a rate that is challenging even the most basic definitions of what it means to be human or to simply be alive. In the midst of a population that is aging, increasing in diversity, and becoming more affluent, the available technology for combating illness and death is forcing an examination of social values and medical structures that deliver curative and rescue technologies. Should stem cell research be conducted on human embryos? Should abortion be used to eliminate fetuses with birth defects or genetic diseases? The ability to conduct fetal surgery has changed many of the issues. How much medical intervention and money should be spent in caring for low-birthweight babies when they are the most likely to die? In 2000 many more low-weight premature babies survived who would have died in 1970. Technology will continue to challenge assumptions on these and many other issues surrounding medical technology and the care of the ill and dying. Policies and practices continue to change as technology opens new issues to be discussed and debated. Policies related to biomedical technologies are shaped by public demands and expectations. The mass media, interest groups, and the legal, political, and religious systems all have input in shaping policy decisions concerning biomedical technologies. For example, the distribution of medical resources is heavily skewed toward the more powerful, technologically sophisticated nations and to individuals in the upper social classes in those same nations. Individuals with money and social status are more likely to receive medical interventions— a practice labeled "concierge medicine." Policy issues also include research and development. As of 2002 the U.S. government supports biomedical research. Strong efforts continue to attempt to block biomedical research for ethical and financial reasons. In 2001 Johns Hopkins had its biomedical research money temporarily rescinded because of public outcry over a death involving the use of human subjects. Questions concerning who does research, who should be funded, and who should receive the benefits of the research will continue to spark controversy. Adequate policy decisions require that goals be clearly conceptualized, as no policy is fair for all people. Policies that maximize the greatest good for the greatest number tend to prevail because of historical roots of American utilitarianism. Alternative values, principles, and lifestyles are often protected and respected as an expression of individual choice. Yet, the ability to pay for high-tech services is not distributed equally. Some segments in U.S. society may have a "right" to health care, such as Medicare patients, but this is not the case for all Americans. Claims about the "sacredness" of individual autonomy, self-determination, and personal privacy confront issues of public concern and even those of vested interests (e.g., tertiary insurance providers). While not everyone believes that life should be prolonged at any cost, collectively, they have yet to determine at what point the "technological fix" is not in the best interest of the patient or society. Forecasting the future is at best an inexact science, but it will include an explosion of advanced technology. How will this technology impact dying, death, funeral rituals, and disposal of the dead? Biomedical advances will impact how and when people die and allow many diseases to be conquered. Genetic engineering may make many illnesses obsolete, allow organs to be regenerated when defective, and provide modification to one's genetic code to avoid disabilities and illnesses. Advances in technology might allow more precise definitions of when life begins and ends, which will facilitate ethical decision making. Funeral rituals and grieving processes already include the use of technology via the Internet. One can chat online over grief, place memorials for pets, obtain information for aiding children and others who are grieving, and find information about funerals or related dying and death areas. The use of such technology can only increase in the future. Advances in technology have already made cremation a more reasonable alternative to burial and, for some, the deep-freezing of cryonics portends the way of the future. Tradition may slow the acceptance of technology, but it will not stop the impact of technological change on the future of death. Devries, Brian, ed. End of Life Issues: Interdisciplinary and Multidimensional Perspectives. New York: Springer Publishing, 1999. DeVries, Raymond, and Janardan Subedi, eds. Bioethics and Society: Constructing the Ethical Enterprise. Upper Saddle River, NJ: Prentice Hall, 1998. Gaylin, Willard, and Bruce Jennings. The Perversion of Autonomy: The Proper Use of Coercion and Constraints in a Liberal Society. New York: The Free Press, 1996. Hoefler, James M. Deathright: Culture, Medicine, Politics, and the Right to Die. Boulder, CO: Westview Press, 1994. Moller, David Wendell. Life's End: Technocratic Dying in an Age of Spiritual Yearning. Amityville, NY: Baywood Publishing, 2000. Petrinovich, Lewis. Living and Dying Well. Cambridge, MA: MIT Press, 1996. Walters, Leroy, and Julie Gage Palmer. The Ethics of Human Gene Therapy. New York: Oxford University Press, 1997. Zussman, Robert. Intensive Care: Medical Ethics and the Medical Profession. Chicago: University of Chicago Press, 1992. See D YING , P ROCESS OF . I pretty much agree with some of the parts of this article. This is helpful.